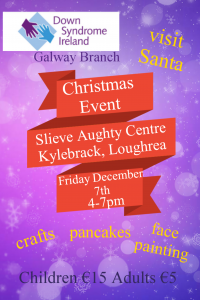 This year’s Christmas social promises to be a unique occasion at the Slieve Aughty Centre, Dec 7th 4-7pm. The children will meet the big man in groups with other families. Santa will tell stories and invite each child to sit and chat with him before they receive a gift. Besides meeting Santa there are lots of other things to do. Santa’s pony ‘reindeer’ can be petted or even better, taken for a spin in the sand arena. See what the fairy folk are up to in the enchanted forest. Pet the farm animals, browse the Christmas shop and enjoy the festive music. The children can make crafts and get their faces painted. There will be yummy pancakes for all to enjoy. Please bring wellies and outdoor clothing to really make the most of the visit! We hope as many of our members will be able to join us!